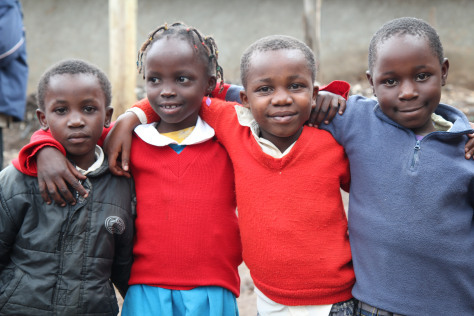 In Kenya's largest slum, the Kibera School for Girls is providing little girls with the chance of their lives—a refuge from abuse and hunger. DAVID GREGORY, anchor (Washington, DC): Finally from us tonight, our MAKING A DIFFERENCE report. Again tonight it is about the lives of girls growing up in one of the poorest places on earth, in Kenya . Last night our Maria Menounos reported on one program in Kenya that is making their lives better. Tonight Maria introduces us to a couple of extraordinary people, one a young American woman who had the vision and the persistence to create a remarkable refuge for a group of little girls. MARIA MENOUNOS reporting: American college student Jessica Possner wanted to live where she volunteered in Kenya 's largest slum, Kibera . Ms. JESSICA POSSNER: I felt like I had so much to learn. MENOUNOS: There she met Kennedy Odede , a homegrown activist born and raised in Kibera , a place with little sanitation and extreme dangers, especially for girls. Mr. KENNEDY ODEDE: I thought it would be very difficult for an American girl to come and live. Ms. POSSNER: Kennedy was a street boy, just struggling, fighting, making his own way, earning a dollar, $2 a day. He would give it all away . And instead of asking them to pay back the loans, he would just ask them to pass it forward. MENOUNOS: The two work together, encouraging each other's goals. Jessica won the trust of the neighborhood, and Kennedy eventually won a full scholarship to Wesleyan University in Connecticut . For both, it opened a world they never imagined possible. Ms. POSSNER: Kennedy had always talked about wanting to build a school for girls and the other services that he -- the community really needed. MENOUNOS: Jessica also coaxed Kennedy into applying for a $10,000 grant. Suddenly they could see a dream realized. Ms. POSSNER: It was a frenzy. The whole school, I think we built it in four weeks. common here: sexual abuse, HIV , and hunger. Mr. ODEDE: I love you. Mr. ODEDE: I try to welcome them back to the world that they never lived in, to the world where they're important. MENOUNOS: Now as Kennedy finishes his degree, Jessica runs the school in Kibera full-time, along with a loyal community that helps her also manage a health clinic and community center ; an unlikely friendship that has changed not only their lives, but so many more. Maria Menounos , NBC News, Kibera , Kenya .